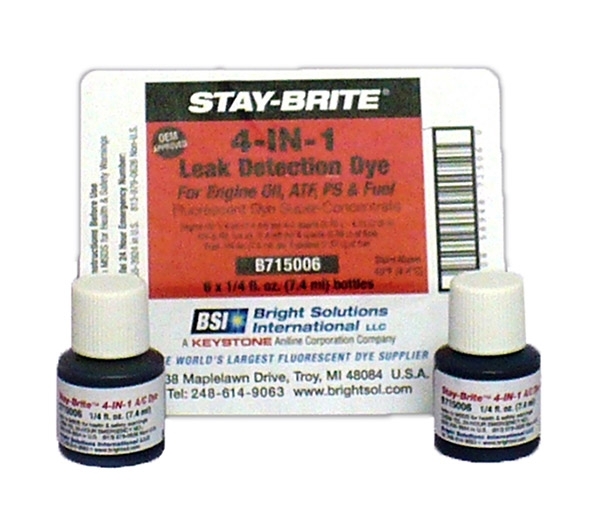 Leak detection products from BSI including Pro-Shot, Eco-Brite and Easy Fill. Maintains flourescence for 5 years or more after application. Compatible with R12, R22, R134a and new refrigerant R1234yf. 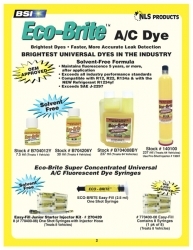 Includes Pro-Shot #13001 and #140100 Eco-Brite cartridge. See description further down the page for full contents of #270475. 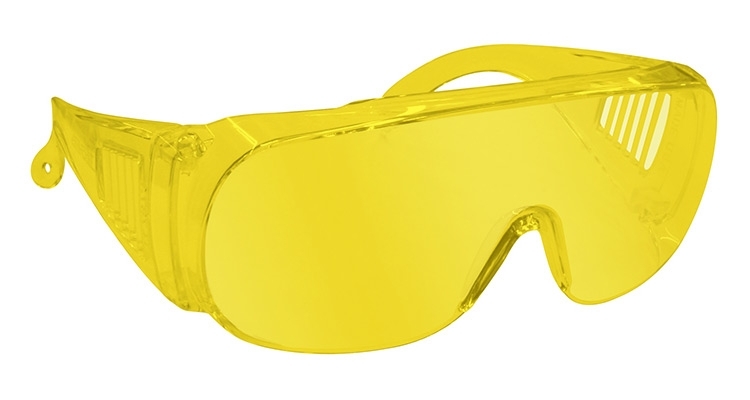 Batteries and fluorescence-enhancing UV glasses included with both lights. 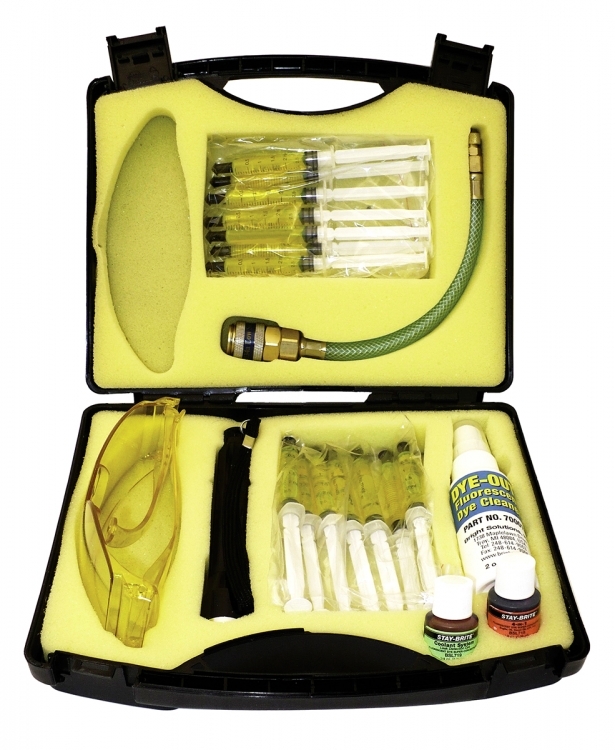 A true professional A/C cartridge system - the easiest, most accurate gun on the market! Designed to pre-measure and inject 1/8 oz. 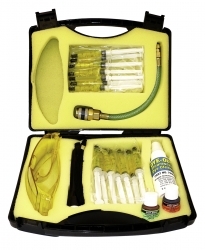 of dye with each stroke, this is the most precise and accurate injection system on the market, eliminating waste yet providing sufficient quantity for a majority of passenger vehicles. 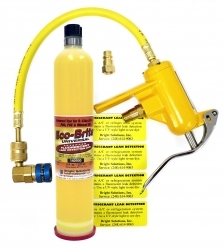 Ideal for injecting into closed, filled A/C systems up to 250 psi. The injector is made of robust die cast alloy and can be fitted with a low side snap coupler for use on R-1234yf A/C systems. A totally clean system, with no leaks. 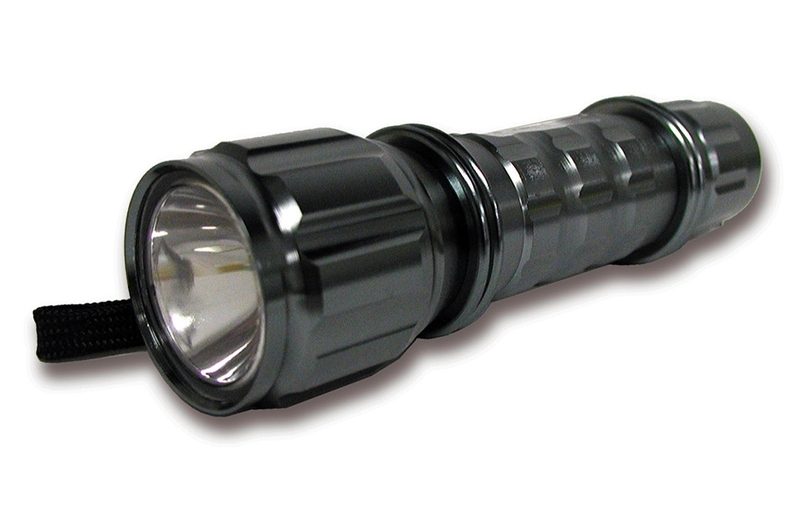 All-metal construction, smooth operation injector includes the injector, hose, adapter and purge fitting. One squeeze injects a pre-measured amount of dye, no over-injection. 237 ml Eco-Brite Universal A/C Dye Cartridge (stock #140100). One shot per vehicle, guaranteed 64 applications. 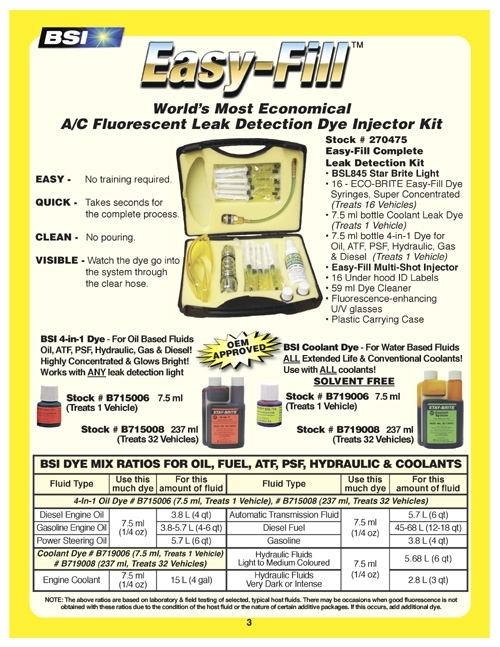 The easiest, most cost-effective A/C dye detection system, the clear injector hose allows you to see the dye entering the system. QUICK: Takes seconds for the complete process. VISIBLE: Watch the dye go into the system through the clear hose. Or show your customers. 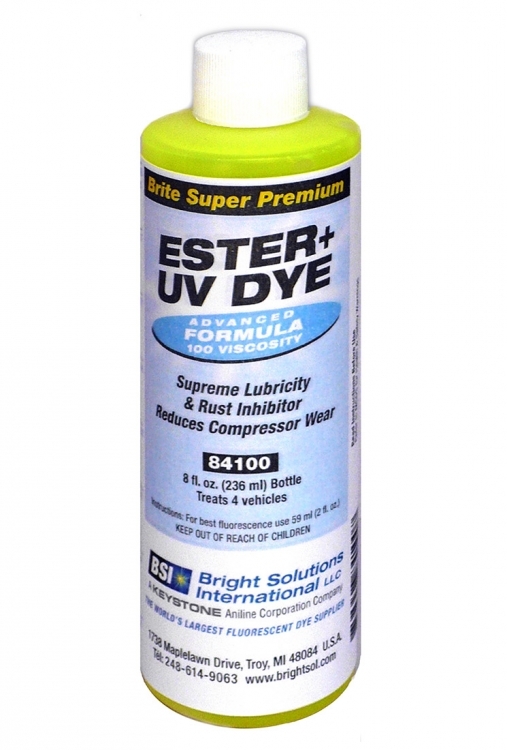 Brite Super Premium Ester (POE) A/C Oil Cartridge. 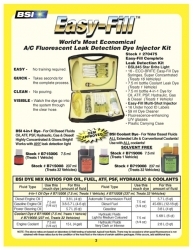 Advanced formula for use in conjunction with the Pro-Shot Injector for top up/charging AC systems after service/repair. 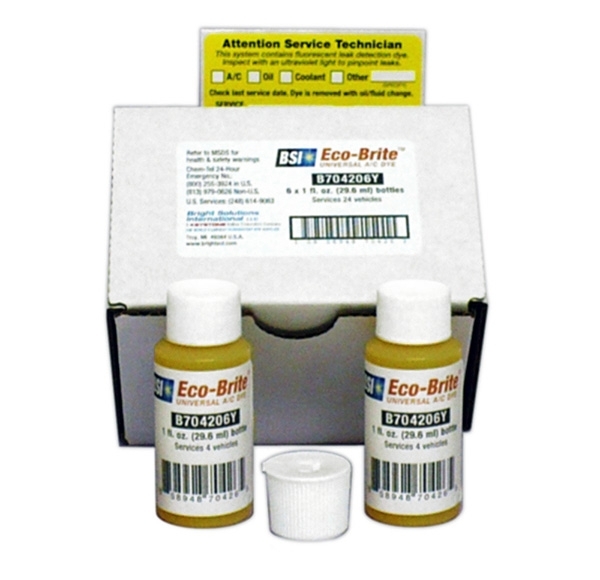 Stock #130155 - 100 Viscosity, 237 ml cartridge, treats 4 vehicles. 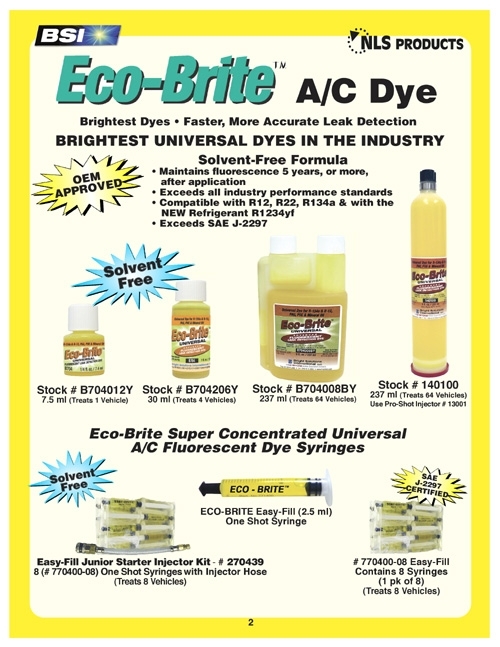 Brite Super Premium PAG A/C Oil Cartridge. Advanced formula with supreme lubricity to inhibit rust and reduce compressor wear. 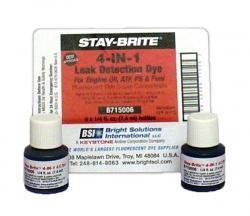 Contains UV Dye to facilitate Leak detection. Stock #130130 - 46 Viscosity, 237 ml bottle, treats 4 vehicles. Stock #130135 - 100 Viscosity, 237 ml bottle, treats 4 vehicles. Stock #130140 - 125 Viscosity, 237 ml bottle, treats 4 vehicles. 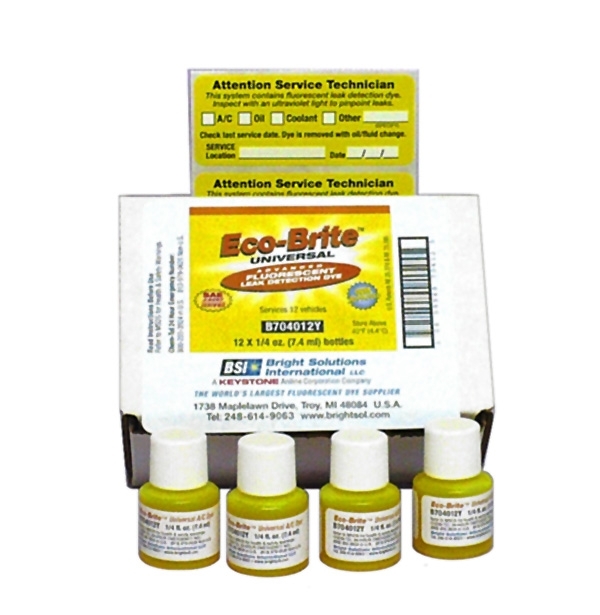 Stock #130145 - 150 Viscosity, 237 ml bottle, treats 4 vehicles. 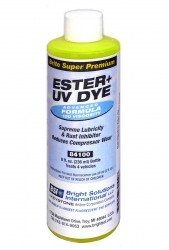 Brite Super Premium Ester (POE) A/C Oil, with UV Dye. 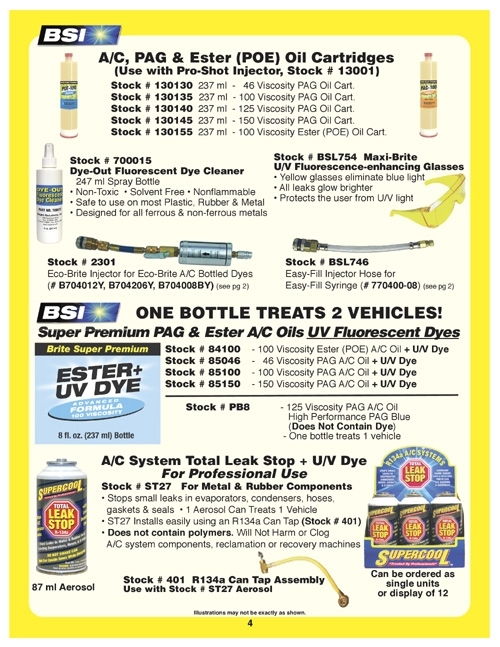 Stock #84100 - 100 Viscosity, 237 ml bottle, treats 4 vehicles. Brite Super Premium PAG A/C Oil, with UV Dye. Stock #85046 - 46 Viscosity, 237 ml bottle, treats 4 vehicles. 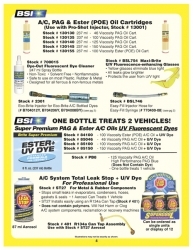 Stock #85100 - 100 Viscosity, 237 ml bottle, treats 4 vehicles. Stock #85150 - 150 Viscosity, 237 ml bottle, treats 4 vehicles. Oil, ATF, PSF, Hydraulic, Gas and Diesel! Highly concentrated and glows bright. 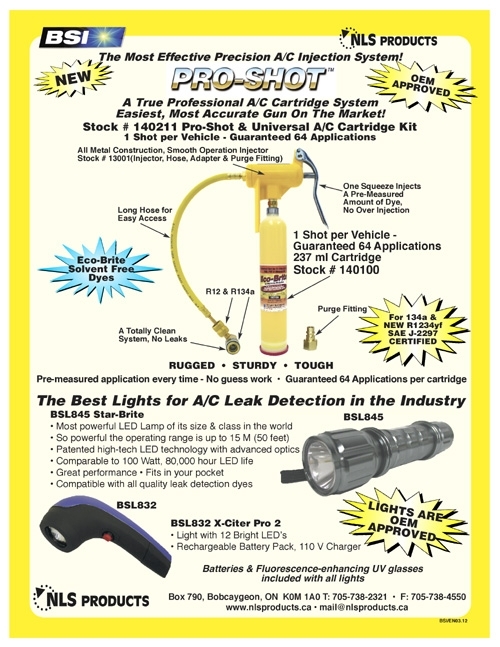 Works with ANY leak detection light. 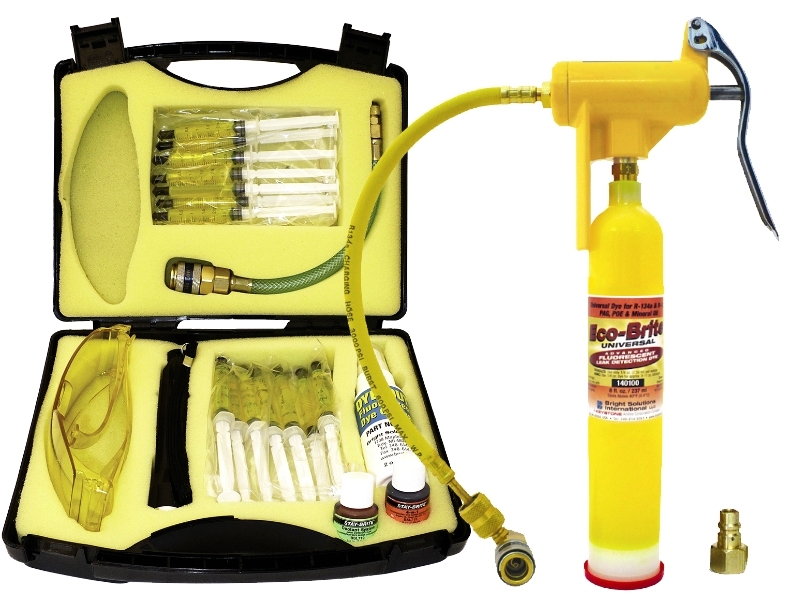 Stock #B715006 - 7.5 ml bottle, treats 1 vehicle. 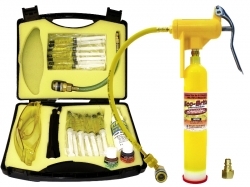 Stock #B715008 - 237 ml self-measuring bottle, treats 32 vehicles. 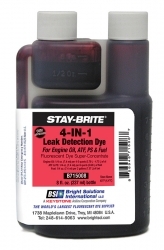 For leak detection use in all automotive coolants, conventional and extended life – will not discolor. Recommended dilution: 1/4 oz per vehicle (up to 4 gallons). Does not contain polymers. Will not harm or clog A/C system components, reclamation or recovery machines. 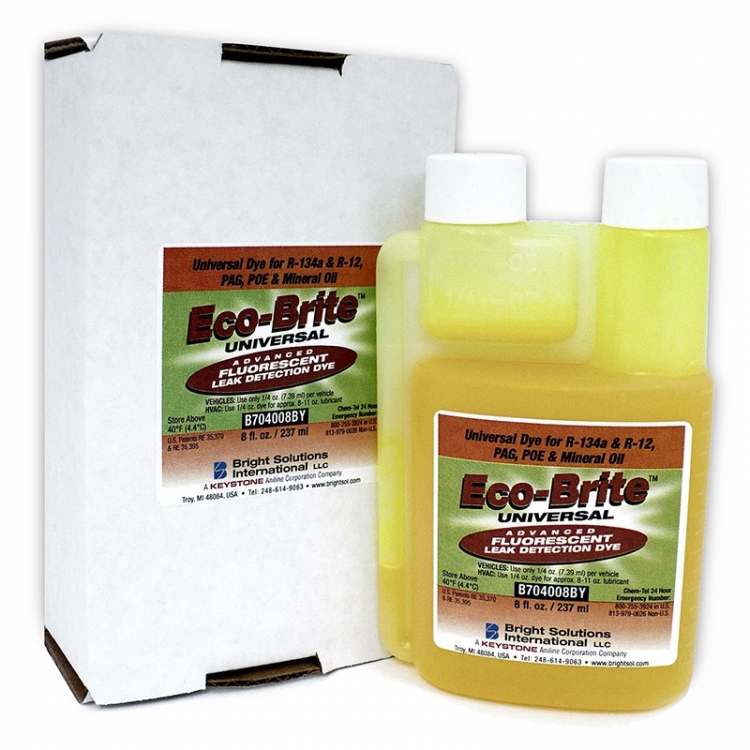 Quickly remove dye with this effective and safe water based cleaner. UV Leak Detection light with single Super-Brite LED finds leaks fast. 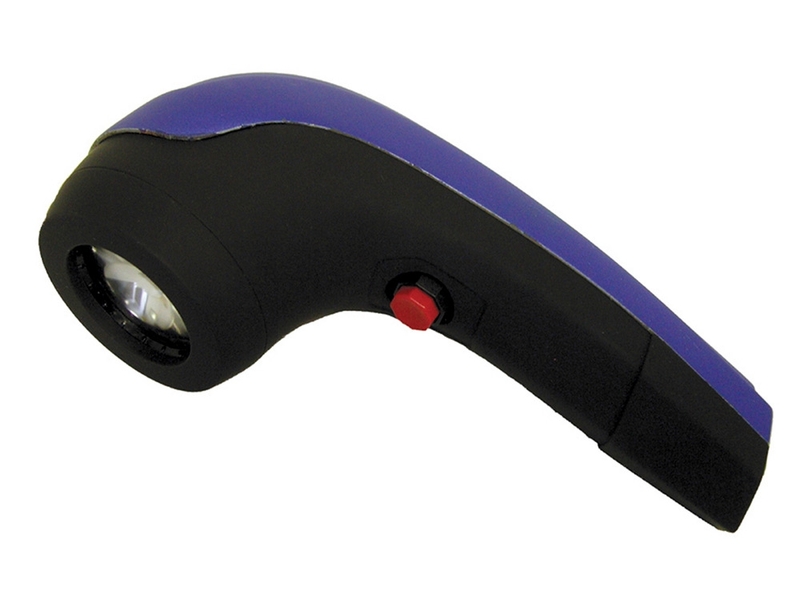 Re-chargeable cordless UV Leak Detection light with 12 Super-Brite LEDs uses patented technology to fluoresce even the smallest leaks. Designed to visually optimize dye fluorescence with all of our lamps for enhanced leak detection capabilities. 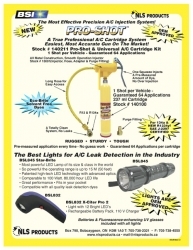 Leak detection products including Pro-Shot, Eco-Brite and Easy Fill from BSI. Distributed in Canada by NLS Products.